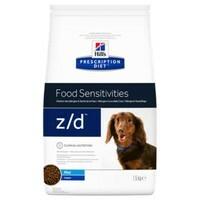 Hills Prescription Diet ZD Food Sensitivities Mini Dry Food for Adult Dogs has been developed especially for smaller breeds of dog to help with the nutritional management of food allergies and/or intolerance. Sensitive skin, coat and ear conditions and digestive problems are potentially serious problems that can be caused by food allergies and intolerance. Using Hills Z/D regularly has been clinically proven to help alleviate and avoid these adverse reactions.